Check the SHOP link in my menu bar for current sale codes & new releases at the Ellen Hutson Shop! April EBE release in my Canvo! It has been a crazy month so far in the Pacific Northwest. We thought the snow storm we got last week would come and go and that would be our snowfall for the year. Boy were we wrong! We are currently in the midst of a major snow storm. YIKES! So I thought that turning this Mama Elephant Yeti into a Valentine would be completely appropriate this year. This is one of my favorite Yetis because it can hold things! First I stamped the Yeti & a tiny flag with the Lawn Fawn Jet Black ink that can be used with alcohol based markers. I colored the images with Copic markers, the colors are listed below. Then I die cut everything. I stamped the sentiment “Love You” using the VersaFine Clair ink in red tulip and cut it out by hand. Next I stamped a conversation heart from the How you bean? Conversation Heart Add-On in Catherine Pooler’s It’s A Girl. Then I added the sentiment “YOU ROCK” in VersaFine Clair, Tulip Red. This is my favorite red pigment ink, it leaves such a great impression on the first try! After everything was stamped I die cut the image with the matching die. 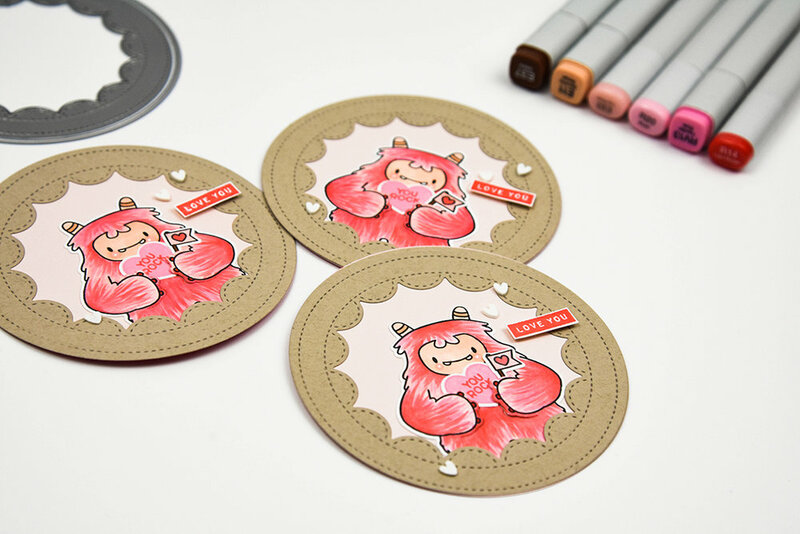 To create the frame I used on of my Hero Arts Infinity Nesting Circles around the Mama Elephant Framed Tag die. Then using that same nesting circle, I cut a circle from some pale pink cardstock. Finally, I assembled the tag by gluing the conversation heart and the tiny flag in the Yeti hands. Then I glued the Yeti to the pale pink circle. I placed the frame over the Yeti image and glued it in place. Using some foam tape, I adhered the “Love You” sentiment to the tag front. I added a few hearts to the front that are by Honey Bee Stamps. They have some really fun embellishments. These cute tags will be included with the gift tag I did last week. Stay tuned for my complete Valentine Day project! Thanks for stopping by today. Happy crafting, friends. The quality of our time is determined by our ability to be present. Thank you for choosing to hear updates about my site! I’ll be in touch soon. Check the SHOP link in my menu bar for current sale codes & new releases!